Discussion in 'Marketplace Discussions' started by kwadguy, Jan 19, 2019. 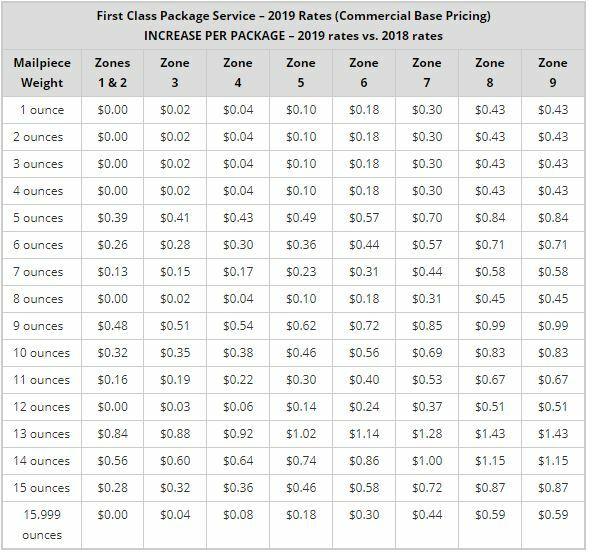 First class mail is going to be priced according to zone (distance traveled), like Priority mail. And some of the jumps are quite substantial. Example: Shipping a 5 oz package across the country (e.g. a CD) goes up $0.84! PhantomStranger, Romerovm, cwitt1980 and 2 others like this. Starts 1/27/19. Good luck to all! For you album sellers, Media Mail rate is going up also. Audionerd, eelkiller, E.Baba and 2 others like this. I wonder how this will impact the volume CD sellers on the low end. The market was already drying up and rising postage is going to cut into sales even more. I really miss GoHastings for their crazy low priced CDs. Once they collapsed, everyone else raised their prices. 0.84 US cents to ship a CD across country? That is incredibly cheap compared to what we pay for postage in Australia. Having said that, I know of two people who are suddenly wanting to return to Australia from the USA ( ) due to rising cost of living, so something is going on. Harvey Rickenbacker and E.Baba like this. It's an increase of .84 not the total price. scobb, darbelob and spanky1 like this. You should try getting anything sent to you *from * the US internationally. I've stopped trying to bother. $30 postage for one LP. Harvey Rickenbacker and ScramMan2 like this. HAHA!! Yes I'm very familiar with insane postage quotes from American sellers. Here we go! US $35.25 to send. One. Single. Comic. I wonder if that's the real USPS price or if there is a bit of gouging going on? Either way USPS prices are way too high. Its actually embarrassing. I keep hoping someone will address the issue but non of the powers that be seem to have the slightest concern about it. And I think they're a bit distracted at the moment. Pretty much the entire used media (CDs and DVDs) market shot up in price after GoHastings disappeared. I still have no idea how GoHastings was making money at those prices. They couldn't have been (part of the problem). They didn't aggregate shipping, and CDs shipped individually from different stores. Example: You'd buy a bunch of $1 CDs with cheap or free shipping. And you might get each CD shipped via USPS from a different store. Shipping was more than you'd paid. Possibly there's also a bit of not particularly wanting to ship overseas. I have seen many American sellers stipulate no overseas shipping over the years, which I can understand, personally. I see a lot of US sellers and buyers worried about dealing with the rest of the world. There's usually enough supply and demand within the US for them not to need to. EU was cheaper than the US and I think still is. It's got more recently. Only a few months ago I got a 12" vinyl from France to AU for 2.5 Euro !! One of the big reasons is nearly every other first world country's budget air mail has tracking available. The USPS doesn't even offer tracking to all countries on the premium and quite expensive Priority Mail (it's available to Canada and some European countries). So any buyer can claim something is lost and Paypal will force the seller to refund their money. You can pay an additional $15.50 on top of the postage cost for registered air mail which will show delivery to the buyer. Additionally in my experience for people abroad buying expensive items they will usually ask to mark the item's value down on the customs, which as of a few years ago USPS will only let you insure something for the customs declared value. chazz101s and ellingtonic like this. Don't worry, ours is insanely expensive without tracking too. Makes it practically impossible to return anything for refund. I've lost $100 when I tried. Looks as if the media mail rate only went up negligibly to $2.75, at least for the 4 to 5 ounce CD packages. This makes media the rate of choice when it comes to avoiding some of those sizable zone increases. Yes $2.75 on the Media Mail. I haven't done any zone FCM yet. I don't get the whole distance-based concept. An item flown from coast to coast must cost the USPS less to transport than one that has to be driven by truck to a nearby state. I'm guessing that the former will be subsidizing the latter, but this is easier to explain to the public. Shipping one CD that would've cost $3.75 first-class Chicago to Seattle last week cost me $4.69 today! Midwest-only buyers need apply for me. I ordered a disc from Experience Hendrix last week and what I assume was first class shipping was $6.28. Then for the first time ever they charge sales tax of $1.51. Meanwhile I order a Salsa disc from Germany and the entire order including shipping is under 9 bucks. I suspect delivering to rural locations will cost the most. Chicago to Seattle, for example will probably cost less than delivering 30 miles to rural farm simply due to economies of scale and the number of items being sent. It's not just the cost of transport, but the time paid out to staff delivering the item. The new GoHastings is Decluttr Store.